New Delhi, 21 July 2017: The Ministry of Rural Development will launch a new sub-scheme under Deendayal Antyodaya Yojana – National Rural Livelihoods Mission (DAY-NRLM) which will be named as “Aajeevika Grameen Express Yojana (AGEY)”. Replying to a question in the Lok Sabha, the Minister of State for Rural Development Shri Ram Kripal Yadav said that the main objectives of AGEY are to provide an alternative source of livelihoods to members of Self Help Groups (SHGs) under DAY-NRLM by facilitating them to operate public transport services in backward rural areas. This will provide safe, affordable and community monitored rural transport services like e-rickshaws, 3 and 4 wheeler motorised transport vehicles to connect remote villages with key services and amenities including access to markets, education and health for the overall economic development of the area. The Minister said that the sub-scheme will be implemented in 250 blocks in the country on a pilot basis for a period of 3 years from 2017-18 to 2019-20. The States have been informed about the number of blocks allocated to them to take up this sub-scheme in the pilot phases. One of the options proposed to be given under the sub-scheme is that the Community Based Organisation (CBO) will provide interest free loan from its own corpus to Self Help Group member for purchase of the vehicle. The Government is implementing DAY-NRLM across the country in all States and Union Territories (except Delhi and Chandigarh). Under DAY-NRLM, till date, 34.4 lakh women SHGs have been promoted under the programme. The financial support under the programme is mainly in the form of Revolving Fund and Community Investment Funds, given as grants to the Self Help Groups (SHGs) and their federations. So far, the total amount released to SHGs is Rs. 1815 crore to about 3.96 lakh SHGs. A sum of Rs. 1088 crore has also been disbursed to 7.28 lakh SHGs as revolving Fund. DAY-NRLM also focuses on bank linkage of the institutions to enable their income The Cumulative Bank Credit mobilized for women SHGs and their federations since inception is to the tune of Rs 1.19 lakh crores. The programme has a special focus on women empowerment including a dedicated component for promoting farm and non-farm based livelihoods for women farmers in rural areas. About 34 lakh women farmers have benefited under this programme. In addition, start-up enterprises at village levels are also supported to promote entrepreneurial activities in those areas. Projects have been sanctioned for setting up 79,814 enterprises in 5209 villages in 17 states in the country. 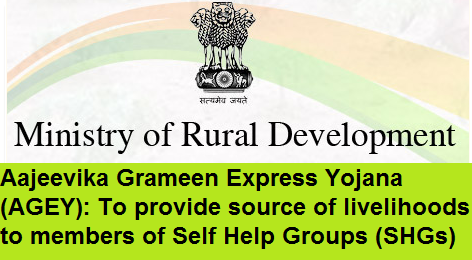 Aajeevika Grameen Express Yojana (AGEY): Objectives to provide alternative source of livelihoods to members of Self Help Groups (SHGs) by facilitating them to operate public transport services in backward rural areas.